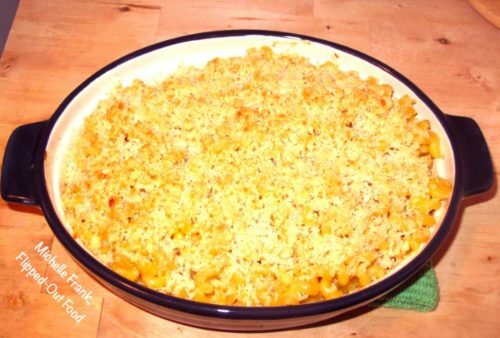 This macaroni and cheese dish is a Frank family favorite. It appears—by request—in large quantities each year when we host a pre-meet pasta party for our daughter’s swim team. It is a regular request for birthday dinners and has traveled to a cabin in Northern Wisconsin during the Frank family vacation. It also played a role that is especially near and dear to my heart: I made mac and cheese for a celebratory dinner with the kids right before Phil and I flew to Florida to get married. This Macaroni and Cheese is likely different from typical macs you’ve had before because it gets a subtle infusion of herbiness and other great flavors from steeping fresh herbs and garlic in the milk that I use to make the roux for the bechamel. We have happily eaten this Macaroni and Cheese with and without meat. One favorite is to add smoked ham. Although I haven’t ever tried it, I’ve been told that lobster mac is one of the most sublime things I will ever taste. It’s on my bucket list. I like to use fun, unusual shapes like cavatappi or gemelli, but plain old macaroni gets the job done just fine. This is also one of those baked pasta dishes that can act as a veggie-delivery double agent (more on that here). You can puree cauliflower and add it into your bechemel sauce without anyone being the wiser. You can also add peas, broccoli, asparagus, or zucchini, for a few examples—IF your family are good veggie eaters and/or don’t balk at having veggies THAT THEY CAN SEE in their pasta. 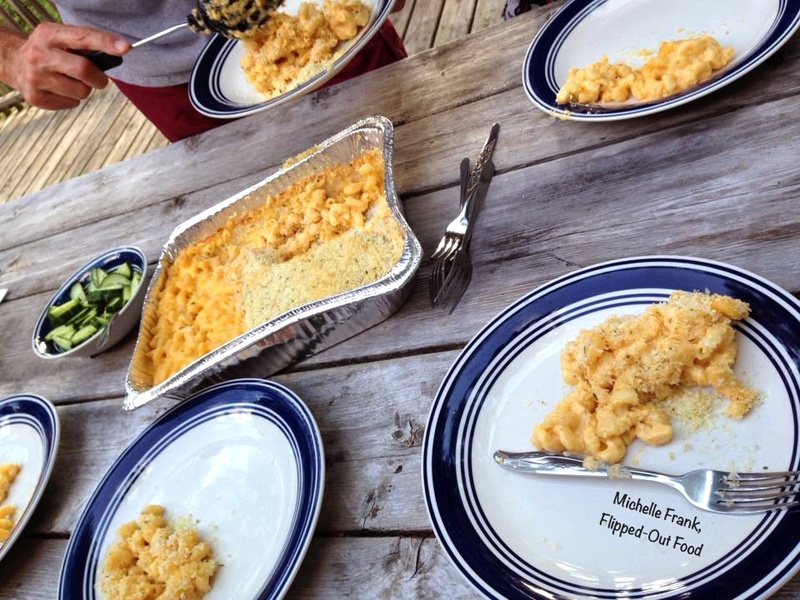 My Macaroni and cheese, made in advance, traveled to a cabin in Northern Wisconsin for an easy, fun dinner. When we vacation, we like to cook at our destination as much as possible. We’ve done homemade pizzas (story coming soon! ), breakfast casseroles, beer-can chicken, burgers—DUH—and, of course, macaroni and cheese. Macaroni and cheese travels well because you can make it in advance and freeze it covered with plastic wrap and aluminum foil. We carry it up to the cabin in a cooler and let it continue thawing in the refrigerator until the next day. All we have to do is discard the plastic wrap, mix the breadcrumbs with melted butter and cheese, sprinkle them over the top of the casserole, re-cover with foil and bake. YUM. 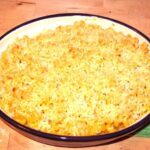 Whether you’re entertaining kids or simply in the mood for comfort food, this mac is sure to please. Strain your milk mixture and slowly add it to the pan with the roux, whisking continuously. Add the mustard, salt, and pepper. Add in your cheddar, little by little, and 3/4 cups of the romano cheese. Stir constantly to avoid scorching until all cheese is melted. Do not use pre-shredded cheese: these contain extra ingredients like corn starch to prevent the shreds from clumping. This will destroy any cheese sauce! Love the idea of steeping milk in garlic and herbs to make this comfort food dish. Thanks, Kate! It does infuse some awesome flavor. Yes! Homemade mac and cheese will always top whatever comes out of a box. I love the addition of herbs in your recipe. I wholeheartedly agree! Thank you, Jasmin! Such a comfort food favorite! Yum! All the herby, garlicky talk has me craving this mac and cheese! I love trying family favorites like this! Pinning it for my next mac and cheese binge!! Thanks, Emily! I hope you love it! Yum! I love a super creamy mac and cheese! Thank you, Cricket! You and me both!